Museums used to be boring, now they captivate me. I am not sure who has done the most changing: me or the museums. This apparent good news does come at a cost: I’ve become the perpetual caboose. I wander behind the rest of the family at half-speed, my little black notebook in hand: reading, studying, learning. 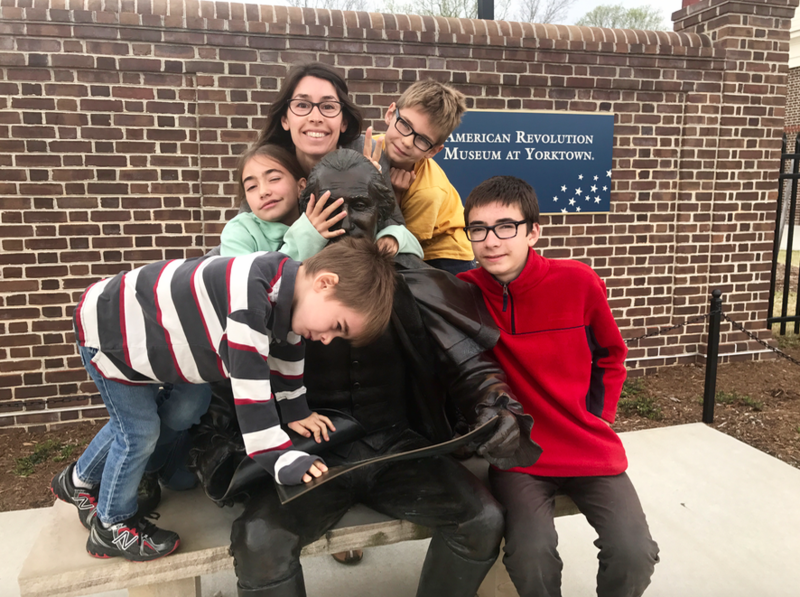 When we arrived at the American Revolution Museum at Yorktown, I was a little nervous for my family. How long would they have to wait for me this time? In the end, the wait was worth it. I walked away with more than just a history lesson. Wasn’t Benjamin a genius? All those clever quotes, sayings, inventions and revolutionary ideas. He had a notebook too you know, just like ol’ Abe Lincoln! They were the ones who inspired me to start my own. But I digress, I am totally getting off track here. 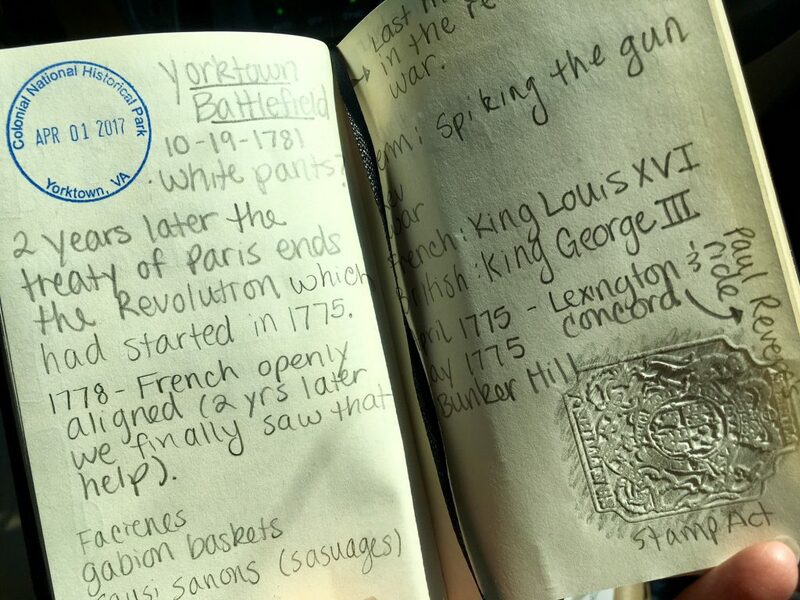 The point is that a lot of museums have taken a page from Benjamin Franklin’s playbook and are not only teaching, but involving visitors with the focus of their content. Learning how the Stamp Act contributed to the early settlers longing for separation from Mother England was educational. But embossing my own notebook with the same seal used to prove tax had been paid in the late 1700’s made it memorable. Reading about a turning point battle of the war is one thing. 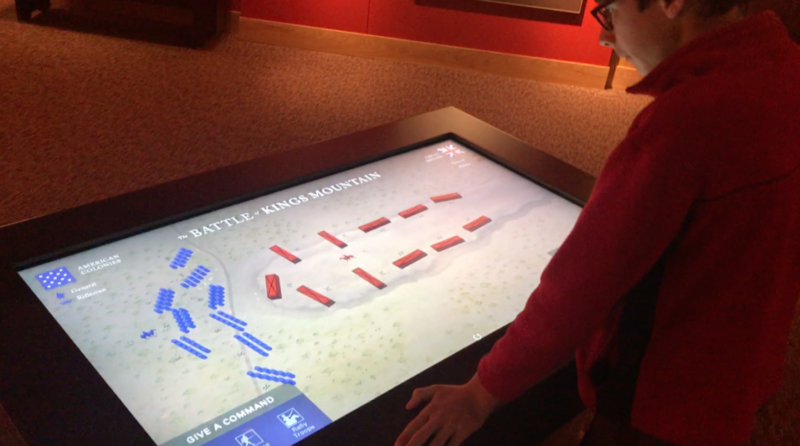 Using a touch screen table to simulate strategies with the same factors in play offers a deeper understanding of the varying tactics that can turn the tide in battle. 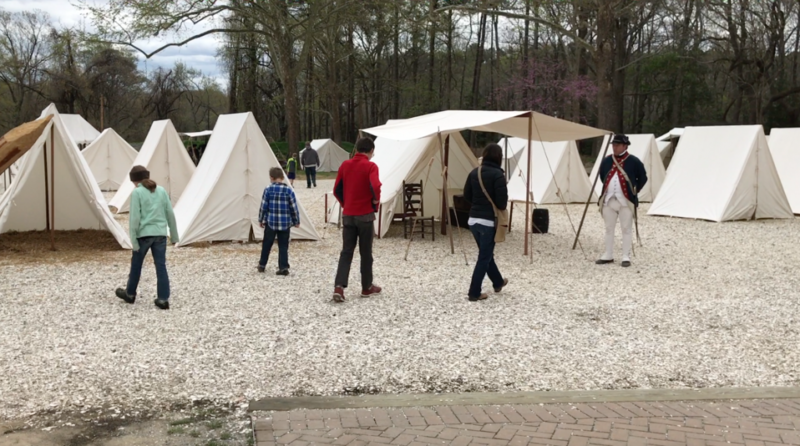 Seeing a photo of how solders lived during war doesn’t leave nearly the lasting impression as walking through a recreated army encampment. 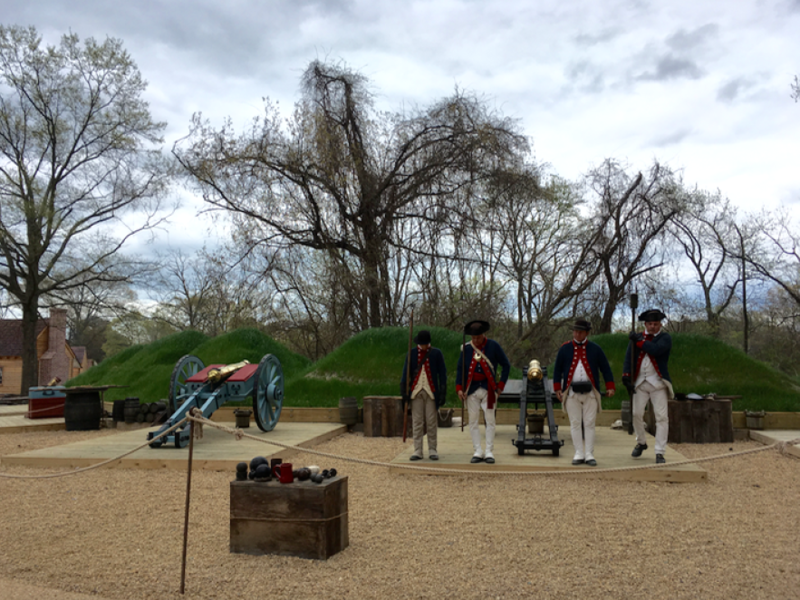 Hearing about the weapons used on the field of battle is fascinating, but put a musket in our hands and now we’ve made a memory we will not quickly forget. 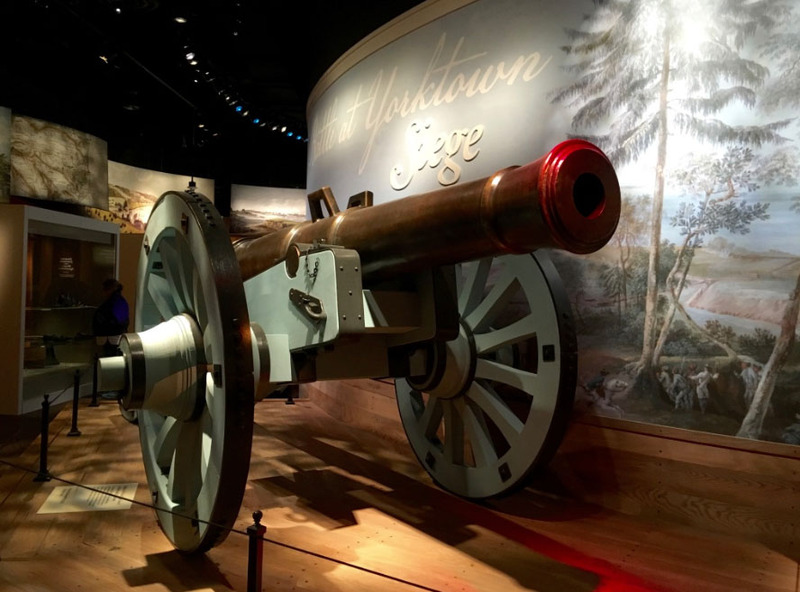 However, of all the interactive displays, movies, artifacts and timelines at the Revolutionary War museum, the thing that resonated with me the most was the lesson I learned during the cannon firing. Sitting in the front row, slightly chilled from the cool spring air a man begins teaching us about the role that the cannon played in the Revolutionary War. 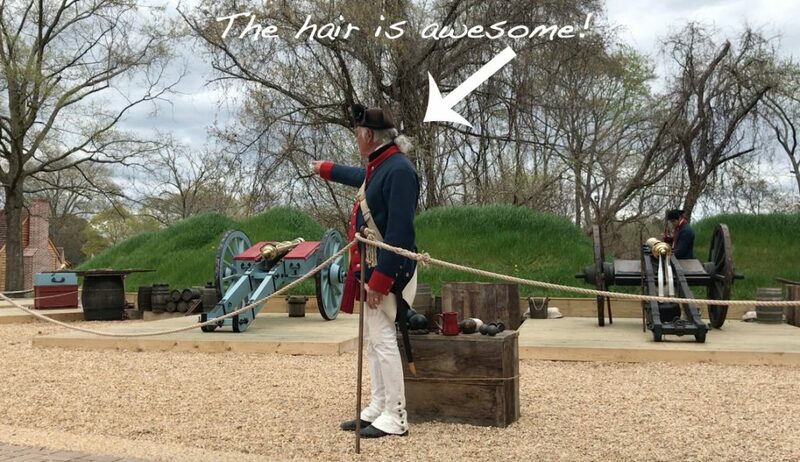 He is dressed so convincingly (check out his hair!) that I wonder if his wife might be at home preserving their meat in barrels of salt. After educating us on the different types of artillery used during the war (mortar, field cannons and howitzers) as well as the inherent strengths and weaknesses of each, he divulges an intensely intriguing detail. To effectively disable a cannon, a barbed steel spike is driven into the touch-hole. The touch-hole is the vent with which the ignition occurs. Essentially it is like breaking a key off in the ignition of your car while it is in the “off” position. While it is possible to remove a spike, it requires a great deal of effort. Keeping in mind that the winner of a battle is largely determined by who is left standing on the field, it is easy to see the benefit of standing your ground. When you disable your weapon and flee, you can’t expect to use it in the future. The imagery that this brings forth in my mind is colorful and poignant. Possible applications begin vying for my attention. I couldn’t help but think of how this scenario plays out in everyday life. What circumstances would convince me to surrender my position of authority as a child of God or tempt me to shrink back from using a gift or talent in His service? What tactics might the enemy use to intimidate me? Ironically, my answer mimics that of a soldier in battle: fear. If you’ve been reading this blog for a few months you’ve had a chance to delve into this topic with me already. I’ve written about the fear that almost kept us from RVing, tackling my fear of uncomfortable situations and my irrational fear of Florida. However, you’d have to be a die hard reader to know that two years ago one of my fears was writing this blog. While I flushed out the entire thought process in this blog post, I’ll summarize by saying that the enemy got close enough to my cannon that I was scared. I disabled my weapon and ran. Satan (our enemy) wants to distract us from the focus of God’s plan and convince us that we don’t have genuine gifts to share or if we do, we would be prideful to use them. If he can convince us to disarm our weapons, he has won. However, even if we do begin using our gifts, he is right there to reason that the purpose of our gifts are to bring us personal glory. Satan’s lies created fear within me. Rather than taking that fear to God, I had allowed it to stop me from using my gift entirely. My story could have easily ended there, in surrender, waving my white flag. However, there is a tactic referred to as “rallying the troops” that is used in battle to boost the morale of those under attack. Essentially someone (usually a commanding officer) speaks life into a situation that looks bleak and reminds those fighting of the cause worthy of their devotion. When I was certain that sharing my story was unnecessary, it was my friends who spoke up. Offering encouragement and prayer, they edified my heart filling me with the confidence that I lacked. While God used a variety of circumstances to help me see that fear was standing between me and a blessing, the most powerful was that of encouragement. After reading a blog post of a dear friend of mine, I’ve been reflecting on the power of encouragement. I believe that it is both underutilized and far too absent from our vocabulary. Perhaps we do not fail to offer needed encouragement to our children, but are we as quick to encourage our peers and elders? I know I am often guilty of singing praises in my mind while never letting a sound escape my lips. How tragic it is to withhold a word of encouragement! God gives us all talents and gifts to use. Using them together and for His glory, we are a formidable foe against the enemy. Let us not miss out on the opportunity to encourage and build each other up. We never know how our words of encouragement may empower others to stand their ground with confidence. That’s a battle plan I can really get excited about. 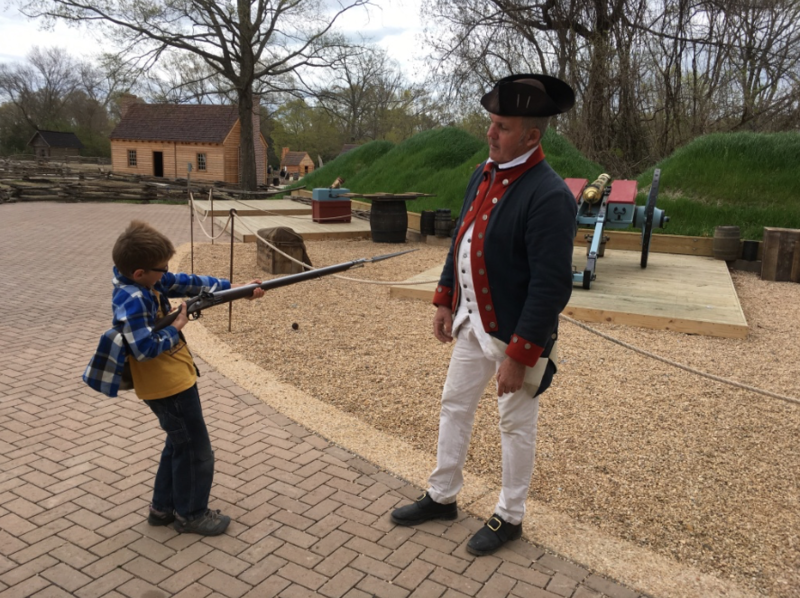 We purchased a homeschool combo ticket for the American Revolution Museum at Yorktown and Jamestown Settlement for $57.25 (this is about 45% off the regular price). Our combo pass allowed us to go to each location one time. The price included three adult tickets (our oldest 13 year old son counts as an adult–lame) and 2 kids tickets (our 5 year old son was free–yea!). Note: we asked for the homeschool discount (it was not advertised). They did request proof that we homeschool and thankfully I had previously made up some official looking homeschool badges for just such an occasion. I suggest arriving early in order to beat the crowds and give yourself enough time to enjoy both the inside museum as well as the outside living history portion. We stayed at the Thousand Trails Williamsburg RV park. This RV park is located within about 20-30 min of all the major historical spots. In our opinion the best site in the park is B44. It is level and very wide. Next Next post: where is home when you are always on the move?